that the Egyptian Government needs the money. The enforcement of the half-and-half division, if intended to enrich the Museum and retain historical material in Egypt, is perfectly justifiable. If, however, this is intended merely to get antiquities to sell, and is considered in the light of the sale of duplicates, one wonders how far Lord Edward [Cecil] (and Kitchener) are prepared to go. Do they realize what the judgement of England will be on this attitude? Worked in Library. Met Weigall. Tells me Maspero has granted a concession to Capt. Parker and his friends, the heroes of the disgraceful affair in Jerusalem, to look for treasure in the Mokattam region. They have no doubt got hold of the same band of native treasure-hunters who have come several times to me with proposals for a hunt in the Mokattam region. I have refused three times. Weigall advised that they be required to employ an archaeologist - a proposal which was refused. Afterwards V. Bissing came in. Lunched at Club. Met Storrs at Kyticas, went with him to Diemer's. Storrs discussed national newspapers with Mr. Finck. Work continued on G 2370. Resumed work on north end of G 2353. Removing the filling of G 2370 on the west, it becomes clear that the large Senedem-ib mastaba (G 2370, [Senedjemib Inti]) is built over older mastabas. 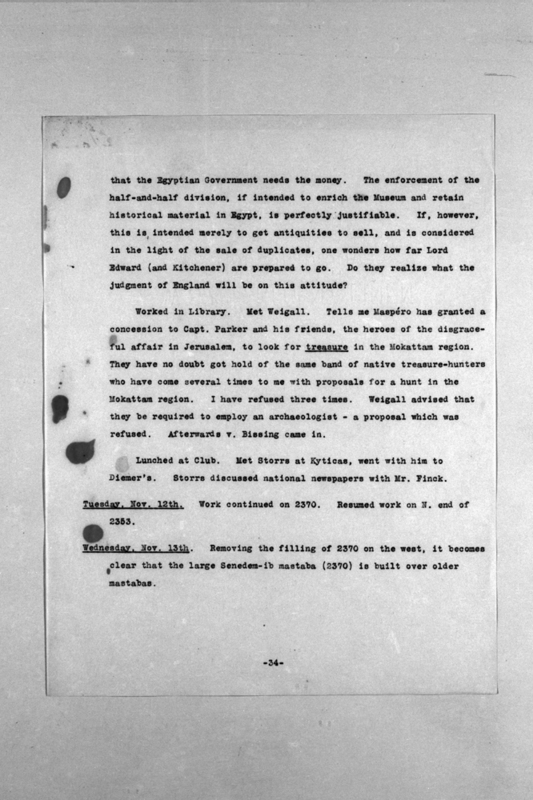 Remarks Freiherr von; Egyptologist. Nationality and life dates from Who was Who in Egyptology. Remarks British army officer and art collector.